Hello and welcome to the My Fair Lady Blog Hop hosted by Gill. You should have just come from Anita's blog. If you are just joining us and want to start from the beginning, please hop on over to Gill's blog. This hop is all about ladies! 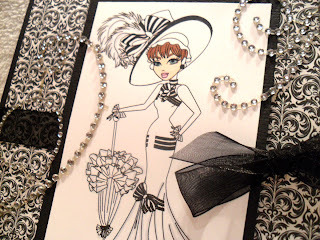 Since the title of this blog hop is "My Fair Lady", I decided to go with a digi of a famous character from a famous movie: Eliza Doolittle from "My Fair Lady". This digi is available from Sassy Studio Designs. I colored her with Copics. I had to use my multiliner for the really tiny sections. 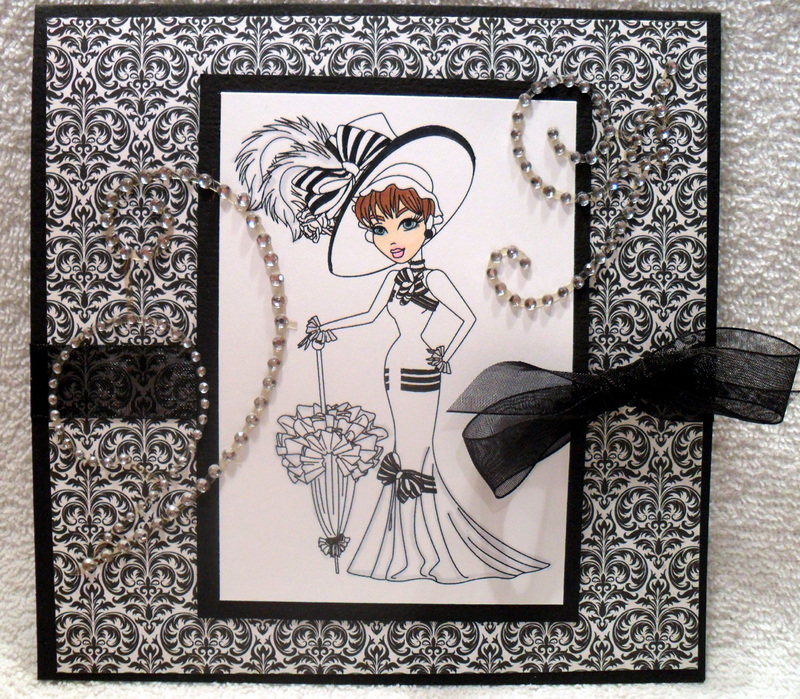 I used some black and white paper from Echo Park, added ribbon and, of course, some bling! Unfortunately, the bling doesn't show up as much as I'd like against the black and white patterned paper. So, below is another angle to give you a better view. Thanks so much for stopping by. I'm the last stop on the hop. Hope you enjoyed seeing all of the projects. ALOHA! very pretty dena! i like how you made it black and white. really cute! 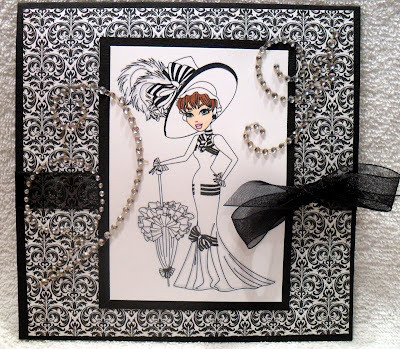 A beautiful card, I like the black and white and bling! I've enjoyed this blog hop - great theme! Beautiful!!!! !All the detail and bling makes it extra special. Love this gorgeous card Dena! This is one of my favorite images of Eliza Doolittle and I love what you have created with it! This is just fabulous. Love the image and the papers too. Your embellishments are gorgeous. Beautiful creation! love the image. Hat on her head is much fabulous,i like your card. Tickled Pink Challenge Zombie Card -- With Bling! St. Patty's Day Card and Blog Candy Update! Me Miss Friend ! and blog candy update! Steampunk Betty and Update on Blog Candy Winners! BLOG CANDY! BLOG CANDY! BLOG CANDY!